Trains are the most convenient way to get to Shiga Prefecture. 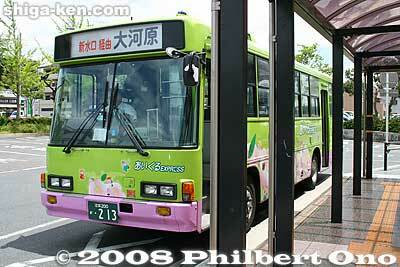 There are long-distance buses (mainly from Tokyo) which are cheaper than trains, but they do not run so often. However, long-distance buses to Nagoya Station run quite often and you can take a local train to Shiga from there. There are no airports in Shiga. The nearest international airports are Kansai International Airport in Osaka and Central Japan International Airport in Aichi Prefecture. 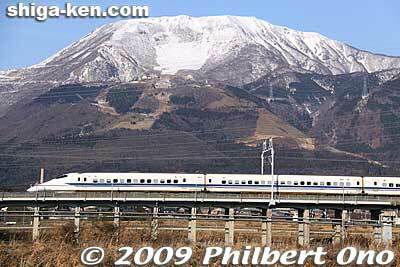 Shinkansen and Mt. Ibuki near Maibara Station. Two shinkansen bullet train stations serve as the main gateways to Shiga: Maibara Station in northern Shiga and Kyoto Station in neighboring Kyoto. Cities in southern Shiga like Otsu and Kusatsu are a short train ride from Kyoto. To visit western Shiga, Yamashina Station in neighboring Kyoto or Omi-Shiotsu Station in northern Shiga is where you get on the JR Kosei Line. The main train lines going to Shiga Prefecture are the Japan Railways (JR) Tokaido Shinkansen, JR Tokaido Line (also called Biwako Line in Kyoto/Shiga), JR Kosei Line, and JR Hokuriku Line. From the east (Tokyo, Nagoya, etc. ), take the Tokaido Shinkansen or JR Tokaido Line. From the west (Hiroshima, Osaka, Kyoto, etc. 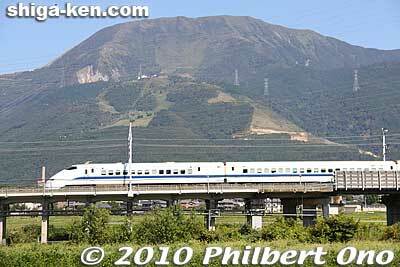 ), take the Sanyo Shinkansen, Tokaido Shinkansen, or JR Tokaido Line (also called Biwako Line. From the Hokuriku Region (Toyama, Kanazawa, Fukui, etc. ), take the Hokuriku Main Line. Details below. The Tokaido Shinkansen has three different trains called Kodama, Hikari, and Nozomi. The train fare is the same, but the number of stations they stop at differ. Kodama trains stop at every shinkansen station so the travel time is the longest. Hikari trains stop at fewer stations, and Nozomi trains stop only at major train stations. Only the Kodama and some Hikari trains stop at Maibara Station. Nozomi trains do not stop at Maibara Station. All Tokaido Shinkansen trains stop at Kyoto Station. Note that the Japan Rail Pass is not valid on Nozomi trains. From Kyoto, you can go to Kyoto Station and catch the JR Tokaido Line (also called Biwako Line to visit southern (Otsu, Kusatsu, Koka, etc.) or eastern Shiga (Hikone, Nagahama, etc.) To visit western Shiga (Katata, Takashima, Imazu, etc. ), take the JR Kosei Line. Also, the Tozai subway line (Sanjo-Keihan Station, etc.) goes to Keihan Yamashina Station where you transfer to the Keihan Keishin Line for Biwako Hama-Otsu Station (Otsu Port). Biwako Hama-Otsu Station enables you to transfer trains to visit Ishiyama-dera temple, Miidera temple, Omi Jingu Shrine, and Sakamoto. From JR Tokyo Station to Maibara Station: About 2.5 hours via shinkansen bullet train. All Kodama trains and a few Hikari trains (about once an hour) stop at Maibara. Or get off at Kyoto Station and take a local train to Shiga. Takes 2.25 hours from Tokyo to Kyoto via Nozomi shinkansen, then 10 min. to Otsu via JR Tokaido Main Line. From JR Kyoto Station to Otsu Station: About 10 min. via JR Tokaido/Biwako Line. From Sanjo-Keihan (Kyoto) to Keihan Biwako Hama-Otsu Station: 25 min. via Keihan Keishin Line. From JR Gifu Station to Maibara Station: About 40 min. via Tokaido Main Line. From JR Nagoya Station to Maibara Station: About 25 min. via shinkansen or 1 hr 15 min. via Tokaido Main Line (train transfer at Ogaki Station may be required). On the map, click on the upper right icon to view the larger map and an alphabetical list of all the train stations and boat ports in Shiga. If you don't have a Japan Rail Pass or if you want to save money, long-distance buses are an economical way to travel in Japan. They pick up and drop off passengers at or near major train stations. There are a number of bus companies to choose from. Generally, JR Bus, affiliated with Japan Railways, is the most expensive, but the most convenient since their bus terminals are right at the train stations. Other bus companies are forced to pick up and drop off passengers at some distance away (10-15 min. walk) from the train stations. Only Willer Express stops at train stations in Shiga Prefecture. From Tokyo, they have buses stopping at Hikone Station, Kusatsu Station, Minami-Kusatsu Station, and Kyoto Station. The buses to Shiga usually run overnight, leaving Tokyo at around 10:30 pm and arriving in the early morning around 5:30 or 6:30 am. The bus fare is around 4,000 to 7,000 yen depending on the day of the week (more expensive on weekends), season, and bus type. Their Web site is also in English. An alternative would be to take a long-distance bus to Nagoya Station or Kyoto Station, then take a local train to Shiga. There are many more bus runs to both stations, including daytime runs. You would also have more bus companies to choose from, although Willer Express is the only one with an English Website as of this writing. From Tokyo (Shinjuku Station), it takes 5.5 or 6 hours to arrive at Nagoya Station (less than 2 hours via shinkansen). The bus makes two toilet stops at rest areas along the Tomei Expressway. Be aware that traffic conditions and highway accidents can delay the bus. From Kansai International Airport in Osaka: The easiest (and most expensive) train is JR Haruka limited express from Kansai Airport. It takes about 75 min. to Kyoto Station. Most Haruka trains terminate at Osaka station or Kyoto Station, but a few trains go all the way to Maibara Station taking 130 min. and stopping at most stations between Otsu and Maibara. All cars are non-smoking and most cars have reserved seating. The train cars have storage space for large suitcases. The fare from Kansai Airport (if you don't have a Japan Rail Pass) is around 3,370 yen (JR Haruka departure timetable). There are cheaper trains which take a longer time. From Central Japan International Airport (Centrair) near Nagoya in Aichi Prefecture: From Central Japan International Airport Station, take the Meitetsu Line to JR Nagoya Station taking about 30 min. Transfer to the JR Tokaido Main Line bound for Maibara Station (end of the line) or the Tokaido Shinkansen (bound for Maibara Station or Kyoto Station). If it is late in the evening, you may have to take the JR Tokaido Main Line train terminating at JR Ogaki Station where you transfer to a train one going to Maibara Station. From Nagoya Station, the last train for Maibara (via Ogaki Station) leaves at around 10:45 pm, taking about 75 min. 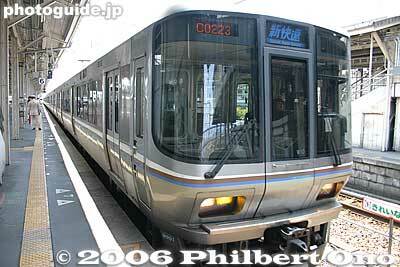 Travel within Shiga is easy via JR Lines, private railways, local city buses, bicycle, and taxis. There is at least one train station in almost all cities and towns in Shiga. It is possible to travel around Lake Biwa entirely by train with the JR Tokaido Main Line and Hokuriku Main Line on the eastern side and the scenic Kosei Line along the western shore. However, since it is not a loop line, at least two train transfers (at Yamashina Station and Omi-Shiotsu Station) will be necessary along the way. Train runs along the heavily-traveled Tokaido Main Line (also called Biwako Line between Nagahama and Kyoto) are frequent, and less frequent along the Kosei Line along the western shore. On the east side is the JR Kusatsu Line shooting off from Kusatsu Station until it reaches Mie Prefecture. 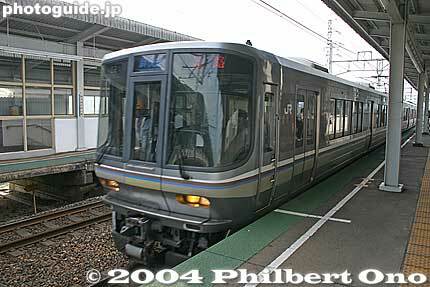 Also in eastern Shiga, the private Ohmi Railways serve a few cities such as Maibara, Hikone, Higashi-Omi, Taga, and Koka. Be aware that Ohmi Railways trains are slow and not that frequent. On weekends (Fri., Sat., Sun., and national holidays), the "One Day Smile Ticket" is only 820 yen and valid to ride on Ohmi Railways all day. A good deal if you plan to ride the Ohmi Railways train at least twice. Also, during non-rush hours (9 am - 4 pm), you can bring your bicycle aboard the train. If you like train stations, see Shiga's Top 20 train stations for some of Shiga's best-looking train station buildings. 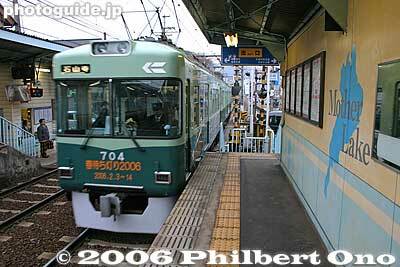 Shiga's train lines and train stations and nearby major sights and facilities are as follows. Kashiwabara Station (柏原駅) - The station after Sekigahara Station in Gifu. A former stage town on the Nakasendo Road. A local history museum, Tokugen-in Temple, and Kitabatake grave. Omi-Nagaoka Station (近江長岡駅) - Gateway to Mt. Ibuki and Mishima Pond. Bicycle rental at Green Park Santo (accessible by bus). Samegai Station (醒ヶ井駅) - Former stage town on the Nakasendo Road. Famous for the Samegai Trout Farm and baikamo underwater river flowers in sumer. Maibara Station (米原駅) - Tokaido shinkansen bullet train stop and where the Tokaido/Biwako Line and Hokuriku Line intersect. You can transfer to the Hokuriku Line to travel to Fukui, Ishikawa, and Toyama Prefectures. Hikone Station (彦根駅) - One of Shiga's major cities and tourist bases with Hikone Castle, Hikone Port (for Chikubushima), and shrines and temples. Minami-Hikone Station (南彦根駅) - Viva City shopping center and movie theaters. Notogawa Station (能登川駅) - Giant water wheel is the town's symbol, and the station's facade is also partially shaped like a water wheel. Bicycle rental at the station. Azuchi Station (安土駅) - Rent a bicycle and cycle to Azuchi Castle ruins, House of Nobunaga, and the archeaological museum. Bicycle rental in front of the station. Omi-Hachiman Station (近江八幡駅) - Another major tourist base with Hachiman-yama mountain for great views of the city and Lake Biwa, Suigo boat rides, Hachiman-bori moat which is the historical part of town, and buildings by the American architect Vories. Bicycle rental at the station. Yasu Station (野洲駅) - Mt. Mikami, Hyozu Taisha Shrine, and rice-planting festival in May. Bicycle rental at the south exit (Minami-guchi) at the Yasu Tourist Office (077−587−3710) until 5 pm (closed Mon.). Moriyama Station (守山駅) - Another stage town on the Nakasendo Road with noted shrines and temples mostly on the west side (toward the lake) of the station. The east side has little. Bicycle rental at the tourist office (077−514−3765) at the west exit until 7:30 pm. Also bicycle rental at Laforet Biwako (phone: 077-584-2180), a hotel on the lakeshore (accessible by bus from the station). Ritto Station (栗東駅) - Daiho Shrine is nearby on the west side of the station. Kusatsu Station (草津駅) - A former stage town on the Nakasendo Road. The Kusatsu-juku Honjin is a marvelous example of the luxury accomodations used by feudal lords and emperors when they traveled in the old days. Tourist info booth near the turnstile. Bicycle rental (phone: 077−565-9052) at east exit street level. Seta Station (瀬田駅) - By bus, go to the "Bunka Zone" (Culture Zone) that has a Japanese garden, the Shiga Prefectural Library, and the The Museum of Modern Art, Shiga. Ishiyama Station (石山駅) - Ishiyama-dera Temple is a must-see and the Seta River and Seta Karahashi Bridge are also historic places. 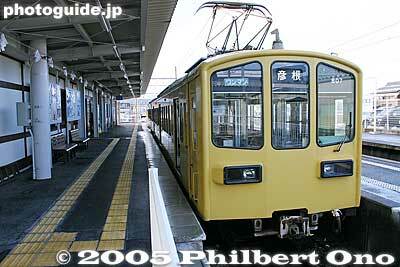 Ishiyama is also a Keihan streetcar stop which cuts through Otsu. Zeze Station (膳所駅) - Zeze Castle ruins. Also near to Otsu's shopping area. Otsu Station (大津駅) - Shiga's capital and a city with many important temples and shrines such as Enryakuji Temple, Ishiyama-dera Temple, Omi Jingu Shrine, Gichuji Temple (where Haiku poet Basho is buried), and a nice lakeshore. After major renovations, the Otsu Station building reopened on Oct. 1, 2016 with a 60-bed capsule hotel (geared for foreign tourists), multilingual tourist information center, free rental bicycles, five restaurants, and an outdoor terrace and event space. From Maibara Station going up north toward Fukui Prefecture. Maibara Station (米原駅) - Tokaido shinkansen bullet train stop and where the Tokaido/Biwako Line and Hokuriku Line intersect. You can transfer to the Hokuriku Line to travel to Fukui, Ishikawa, and Toyama Prefectures. Bicycle rental at the station (drop-off OK at Sakata Station). Sakata Station (坂田駅) - A statue of Lord Yamauchi Kazutoyo and Chiyo (born in Maibara) is nearby. Bicycle rental at the station (drop-off OK at Maibara Station or Nagahama Station). Nagahama Station (長浜駅) - A beautiful, new station building opened in Oct. 2006. A major city and tourist base with Nagahama Castle, Nagahama Port for boat cruises to Chikubushima, Daitsuji Temple, and shopping. Tourist info booth at Ibukiyama/Heiwado exit. Bicycle rental near the station (drop-off OK at Sakata Station or Kawake Station). Torahime Station (虎姫駅) - Country town with the historic Gomura Betsuin Temple. Bicycle rental at the station. Kawake Station (河毛駅) - Visit Odani Castle on a mountaintop. Bicycle rental at the station (drop-off OK at Nagahama Station or Takatsuki Station). Takatsuki Station (高月駅) - Best known for the 11-faced Kannon statue, a National Treasure, at Kogenji Temple. Bicycle rental at the station (drop-off OK at Kawake Station or Kinomoto Station). Kinomoto Station (木ノ本駅) - A new station building was opened in 2006. Take a bus to Mt. Shizugatake where you can ride the lift up the mountain during the warmer months. Great view of Lake Biwa and Lake Yogo. Bicycle rental at the station (drop-off OK at Takatsuki Station or Yogo Station). Yogo Station (余呉駅) - Lake Yogo visible from the station is a small scenic lake north of Lake Biwa. Bicycle rental at the station (drop-off OK at Kinomoto Station or Omi-Shiotsu Station). Omi-Shiotsu Station (近江塩津駅) - Mainly a transfer point between the Hokuriku LIne and Kosei Line. Bicycle rental at the station (drop-off OK at Yogo Station or Nagahara Station on Kosei Line). Kosei Line at Omi-Takashima Station. This train line runs on the west side of the lake. Yamashina Station (山科駅) - In Kyoto. Transfer point between the Kosei Line, Tokaido Main Line, and Kyoto subway. Hie-zan Sakamoto Station (比叡山坂本駅) - Hiyoshi Taisha Shrine, Saikyoji Temple, Hie-zan Sakamoto Cable Car to Enryakuji Temple on Mt. Hiei. Rental bicycles at nearby Sakamoto Station (Sakamoto Tourist Association office) on the Keihan Ishiyama-Sakamoto Line. Ogoto Onsen Station (おごと温泉駅) - Formerly called Ogoto Station. The station's name was changed on March 15, 2008. Ogoto Spa is nearby. Ono Station (小野駅) - Bicycle rental at station (drop-off OK at Kita Komatsu Station). Kita-Komatsu Station (北小松駅) - Yobai no Taki Falls, Hira Genkimura. Bicycle rental at station (drop-off OK at Ono Station). Omi-Takashima Station (近江高島駅) - Shirahige Jinja Shrine (torii in lake), Haginohama Beach, Omizo Castle, Otomegaike Pond, Ireland Koryukan Village. Bicycle rental at the station (drop-off OK at Adogawa Station). Adogawa Station (安曇川駅) - Biwako Kodomo no Kuni, Yomeien Garden. Bicycle rental at the station (drop-off OK at Shin-Asahi Station, Omi-Imazu, or Omi-Takashima Station). Shin-Asahi Station (新旭駅) - Shin Asahi Windmill Village. Bicycle rental at the station (drop-off OK at Omi-Imazu Station or Adogawa Station). Omi-Imazu Station (近江今津駅) - Imazu-ko Pier (boat to Chikubushima island), Biwako Shuko no Uta Shiryokan song museum, Biwako Shuko no Uta song monument, Imazu Vories Shiryokan museum, Mt. Hakodate-yama. Bicycle rental at the station (drop-off OK at Makino Station, Shin-Asahi Station, or Adogawa Station). Makino Station (マキノ駅) - Makino Sunny Beach, Kaizu Osaki coast. Bicycle rental at the station (drop-off OK at Nagahara Station or Omi-Imazu Station). Nagahara Station (永原駅) - Marukobune no Yakata museum, Ranta no Yakata, Haraobi Kannon Temple. Bicycle rental at the station (drop-off OK at Makino Station). Omi-Shiotsu Station (近江塩津駅) - Transfer station for JR Kosei Line and Hokuriku Line. Catch another train south to Nagahama/Maibara or north to Tsuruga/Fukui. The line runs from Kusatsu Station to Tsuge Station in Mie Prefecture, with stations in Kusatsu, Ritto, Konan, and Koka. Kusatsu Station (草津駅) - Transfer point between the Kusatsu Line and Tokaido Line. A former stage town on the Nakasendo Road. The Kusatsu-juku Honjin is a marvelous example of the luxury accomodations used by feudal lords and emperors when they traveled in the old days. Tourist info booth near the turnstile. Bicycle rental (phone: 077−565-9052) at east exit street level. Tehara Station (手原駅) - Near Ritto City Hall and Mt. Anyoji. Also near the site of the new Tokaido shinkansen station proposed to be built. Ishibe Station (石部駅) - Former Ishibe-juku stage town on the Tokaido Road linking Edo (Tokyo) and Kyoto. Also Jorakuji Temple and Chojuji Temple are reachable by bus. Bicycle rental at the station (inside the Community House). Kosei Station (甲西駅) - Zensuiji temple and Konan City Hall are nearby. Bicycle rental at station. Kibukawa Station (貴生川駅) - Transfer point for Ohmi Railways and Shiga Kogen Railways. Konan Station (甲南駅) - Bicycle rental at station. 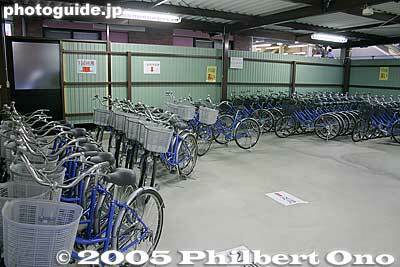 Terasho Station (寺庄駅) - Bicycle rental at the station. Koka Station (甲賀駅) - Take a bus to the Koka Ninja Village. Bicycle rental at station. Aburahi Station (油日駅) - Bicycle rental at the station. Tsuge Station (柘植駅) - In Iga, Mie Prefecture. Transfer to the Kansai Main Line. Ohmi Railways at Taga Taisha-mae Station. From Maibara Station to Kibukawa Station. Maibara Station (米原駅) - Transfer point for the Tokaido Line, shinkansen bullet train, Hokuriku Line, and Ohmi Railways. Toriimoto Station (鳥居本駅) - Toriimoto-juku is a former stage town on the Nakasendo Road. The Western-style station building was built in 1931. Amago Station (尼子駅) - Buses leave this station for the Koto Sanzan Temple Trio. Bicycle rental at the station (drop off OK at Echigawa Station). Echigawa Station (愛知川駅) - Bicycle rental at the station (drop off OK at Amago Station). Gokasho Station (五箇荘駅) - Famous for Omi merchant homes. Bicycle rental at the station. Yokaichi Station (八日市駅) - Main station for Higashi Omi city and transfer point for the Ohmi Railways' Main Line and Yokaichi Line (for Omi-Hachiman). Bicycle rental at the station. Hino Station (日野駅) - Main station for Hino-cho town. Bicycle rental in front of the station. Minakuchi Matsuo Station (水口松尾駅) - Very rural area. Minakuchi Jonan Station (水口城南駅) - Main station for Minakuchi and Koka city. Minakuchi-juku was a former stage town on the Nakasendo Road. Minakuchi Castle is also nearby. Bicycle rental at station. Kibukawa Station (貴生川駅) - Transfer point between the Ohmi Railway Line, JR Kusatsu Line, and Shigaraki Kogen Line. Only two stations on this line which shoots off the Main Line. Takamiya Station (高宮駅) - Transfer point between the Main Line and Taga Line. Takamiya-juku is also a former stage town on the Nakasendo Road. Taga Taisha-mae Station - (多賀大社前駅) - Nearby is Taga Taisha Shrine, one of Shiga's most popular shrines. Runs between Omi-Hachiman Station on the Tokaido Line and Yokaichi Station in Higashi Omi. Omi-Hachiman Station (近江八幡駅) - Major city on the Tokaido Line. Musa Station (武佐駅) - Former stage town on the Nakasendo Road. Tarobogu-mae Station (太郎坊宮前駅) - Unmanned train station. Mainly residential and farmland. Tarobogu Shrine is nearby. Shin-Yokaichi Station (新八日市駅) - Nice Taisho-Period station building. Yokaichi Station (八日市駅) - Main station for Higashi-Omi city (formerly Yokaichi city). Shigaraki Kogen Railway at Kibukawa Station. This short train line operates entirely within Koka city. The main destination is the Shigaraki Ceramic Park. It takes about 22 min. from Kibukawa Station to Shigaraki Station. In September 2013, Typhoon Man-Yi damaged a railway bridge and other parts of the railway, forcing it to close for repairs. Substitute buses are running along the railway line until the railway reopens in 2014. Shigaraki Station (信楽駅) - Station for Shigaraki Ceramic Park. Bicycle rental at station. Two streetcar lines operate in Otsu, Shiga. Keihan Ishiyama-Sakamoto Line at Shimanoseki Station. Otsu's main streetcar line connecting one end of the city to the other. Ishiyama-dera Station (石山寺駅) - Near the famous Ishiyama-dera temple and Setagawa River. Karahashi-mae Station (唐橋前駅) - Near the famous Seta Karahashi Bridge and the Seta River. Keihan Ishiyama Station (京阪石山駅) - Transfer to JR Ishiyama Station on the Tokaido Line. Keihan Zeze Station (京阪膳所駅) - Near the shopping area. Also transfer to JR Zeze Station. Shimanoseki Station (島ノ関駅) - Near the Shiga Prefectural Capital. Biwako Hama-Otsu Station (びわ湖浜大津駅) (formerly Hama-Otsu Station until Feb. 2018) - Shopping area, hotels, and Otsu Port for lake cruises. Miidera Station (三井寺駅) - Near the famous Miidera temple and Biwako Sosui Canal. Otsu Shiyakusho-mae Station (大津市役所前駅) (formerly Bessho Station until Feb. 2018) - Near Otsu City Hall, Otsu History Museum, Ojiyama Sports Park, and Ojiyama Stadium. Keihan Otsukyo Station (京阪大津京駅) (formerly Ojiyama Station until Feb. 2018) - Ojigaoka Park, Ojiyama Sports Park, also transfer to JR Otsukyo Station on the Kosei Line. Omi Jingu-mae Station (近江神宮前駅) - Near Omi Jingu Shrine dedicated to Emperor Tenchi. Sakamoto Station (坂本駅) - Near the Hiezan cable car station to go up Mt. Hiei. Streetcar line connecting Otsu and Kyoto. Misasagi Station (御陵駅) - Transfer to Tozai Line (Kyoto). Kami-sakaemachi Station (上栄町駅) - Former stage town of Otsu-juku on the Tokaido Road. Biwako Hama-Otsu Station (びわ湖浜大津駅) (formerly Hama-Otsu Station until Feb. 2018) - Shopping area, hotels, and Otsu Port for lake cruises. Transfer to Keihan Ishiyama-Sakamoto Line. Cable Sakamoto Station (ケーブル坂本駅) - At the foot of Mt. Hiei in Shiga. Near Sakamoto Station on the Keihan Line and Hiyoshi Taisha Shrine. Horaioka Station (ほうらい丘駅) - Newest station opened in 1984 to enable people to see a stone buddha statue. The cable car stops here only upon request. Motateyama Station (もたて山駅) - Nearby is the grave of poet Ki no Tsurayuki (紀 貫之). Cable Enryakuji Station (ケーブル延暦寺駅) - Terminal station atop Mt. Hiei. A short walk away is Enryakuji temple. "Aikuru" bus from Kibukawa Station. Major train stations such as Otsu Station, Kusatsu Station, Moriyama Station, Yasu Station, Omi-Hachiman Station, and Nagahama Station have a good local bus network. Ask the local tourist info office for directions on which bus to take. If you don't understand the buses or if they come to infrequently, take a taxi available at the larger train stations. The smaller train stations usually have no taxis. In rural areas, it may be difficult to catch a taxi on the street. Buses operated by Ohmi Railways operate from the major train stations. The routes and schedules are in Japanese here: http://www.ohmitetudo.co.jp/bus/rosen/index.html also here at Jorudan: https://mb.jorudan.co.jp/os/bus/shiga/. There is Kojaku Bus that operates in western Shiga in Otsu and Takashima, Teisan Konan Kotsu that operate buses in Kusatsu and Otsu, and Shiga Bus that operates mainly in Yasu. Hikone Station to Hikone Port: Free shuttle bus provided for Omi Marine boat passengers. Major train stations in Shiga have taxi stands. Otherwise, you may have to call for a taxi. 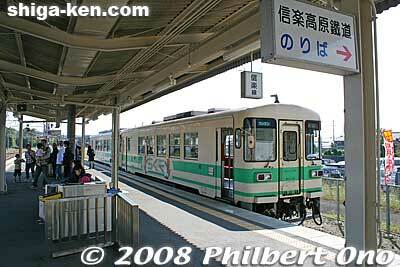 Click here for a list of taxi phone numbers for train stations in Shiga (in Japanese). Rental bicycles at Omi-Hachiman Station. Many train stations have rental bicycles for tourists. Usually, you can rent a bicycle at one train station and return it at another if it's on the same train line. Very convenient and a great way to enjoy the lake views or get to places not often served by buses. The bicycles are rented out by the local tourist association or a private vendor. It's usually 500 yen for the day's rental, and the bicycle must be returned by 5 pm or so. Many major hotels in Shiga also have rental bicycles. In recent years, bicycling around Lake Biwa (called "Biwa-ichi") has become very popular, attracting over 70,000 cyclists annually. To assist these cyclists, "Biwaichi Cycle Stations" have been setup at convenience stores and other spots in Shiga. They may provide food, water, bicycle tire pumps, and bicycle courier service. While most rental bicycles are for short and casual cycling, a few bicycle rental outlets such as Biwako Isshu Rental Cycle at Maibara Station and Moriyama have high-grade bicycles geared for long-distance cycling. The following train stations in Shiga have rental bicycles: Otsu Station, Hikone Station (AL Plaza), Kusatsu Station, Omi-Hachiman Station, Azuchi Station (North exit), Maibara Station (East exit), Sakata Station, Nagahama Station, Torahime Station, Takatsuki Station, Kawake Station, Kinomoto Station, Yogo Station, Omi-Shiotsu Station, Nagahara Station, Makino Station, Omi-Imazu Station, Omi-Takashima Station, Shin-Asahi Station (West exit), Adogawa Station, Sakamoto Station, Terasho Station, Konan Station, Ishibe Station, Kosei Station, Koka Station, Aburahi Station, and Shigaraki Station. If you have your own bicycle, you can cycle around the lake in 3 days, assuming you also want to see the sights. The ride can be shortened to two days if you opt to ride across the Biwako Ohashi Bridge at the neck of the panhandle and skip riding on the southern shore (Otsu). There is a lakeshore road or cycling road along most of the way, and the terrain is flat almost all the around. Very scenic compared to riding a train. The only tough part is the mountainous northern area where the road goes up a mountain near Sugaura (Oku Biwako Parkway or Route 512). Most people avoid this road and take the flatter route on Route 303 going through the long tunnel. The views are much better along the steeper Oku Biwako Parkway, but it can be hazardous with loose rocks falling down the cliffs. Check information on road conditions before going up Route 512. The downhill ride is thrilling. Riding in a counterclockwise direction (left side of the road) will put you closer to the lake. From Otsu, the Michigan paddlewheel boat offers cruises on Lake Biwa. Lake Biwa has boats operating from Otsu Port, Hikone Port, Nagahama Port, Imazu Port, and Horikiri Port. The main destination is Chikubushima island in northern Lake Biwa from Hikone Port, Nagahama Port, and Imazu Port. Horikiri Port has boats going to Okishima island, the lake's largest island inhabited by a few hundred people. It's possible to cross Lake Biwa between Nagahama Port and Imazu Port by boat via Chikubushima island. From Otsu Port, Biwako Kisen operates sightseeing cruises on the Michigan paddlewheel boat for daily daytime and dinner cruises within the lake's panhandle. A 60-min. cruise is 2,000 yen for adults. The company also operates the Bianca luxury boat for cruises around the entire lake. The other cruise company is Omi Marine which operates boats mainly from Hikone Port for cruises to Chikubushima island, Kaizu-Osaki (popular during cherry blossom season), and tiny Takeshima island. This company is affiliated with Ohmi Railways. eki konai 駅構内 – inside or within the train station. Midori no Madoguchi みどりの窓口 – Manned ticket counter or office at major train stations to buy reserved seat tickets (and rail passes). Colored in green and usually open from 5:30 am to 10 pm. shiteiseki 指定席 – reserved seating, extra charge required. machiai-shitsu 待合室 - Waiting room in the train station. A room to keep warm in winter or cool in summer while waiting for your train. Most train stations have a small waiting room on the platform. kaisatsu 改札 – Turnstile or ticket gate where you present your ticket or tap card. Futsu 普通 – Local train stopping at every station. Also called Futsu-ressha 普通列車. kaku-eki 各駅 – Stops at every station. Tokkyu 特急 – Limited Express long-distance trains stopping only at major train stations. Extra charge required. Green-sha グリーン車 – First-class car requiring extra charge. shinkansen 新幹線 – Bullet train. Nozomi only stops at the major stations (doesn’t stop at Maibara). Hikari trains stop at a few more stations (sometimes Maibara) and Kodama trains stop at all shinkansen stations on the Tokaido Shinkansen Line. okure 遅れ – Delayed train. Usually preceded by the number of minutes the train is delayed. yusen-seki 優先席 – Courtesy seat for elderly, handicapped, etc. Formerly called “silver seat” シルバーシート. senro – 線路 – Railroad/train tracks. If you drop something on the tracks, alert the station staff. homu ホーム – Station platform where you board the train. Roku-ryo-hensei 6両編成 – Six-car train. If it’s a 10-car train, it’s called Ju-ryo hensei. nanban-sen 何番線 – Which platform No.? shasho 車掌 – On-board train conductor who may check your express train ticket (on tokkyu and shinkansen). He/she also sells train tickets if your boarding train station does not have a ticket machine or manned ticket window. shuten 終点 – Last stop on the train line. coin locker コインロッカー – Coin-operated lockers for luggage. Only the larger train stations have it. Index to Shiga-related transportation articles. This page was last edited on 23 March 2019, at 12:58.